Our visit to the Mashpi Lodge was a long time coming. Four years ago while we were still working in New York City, Tasha took a solo trip to Ecuador. 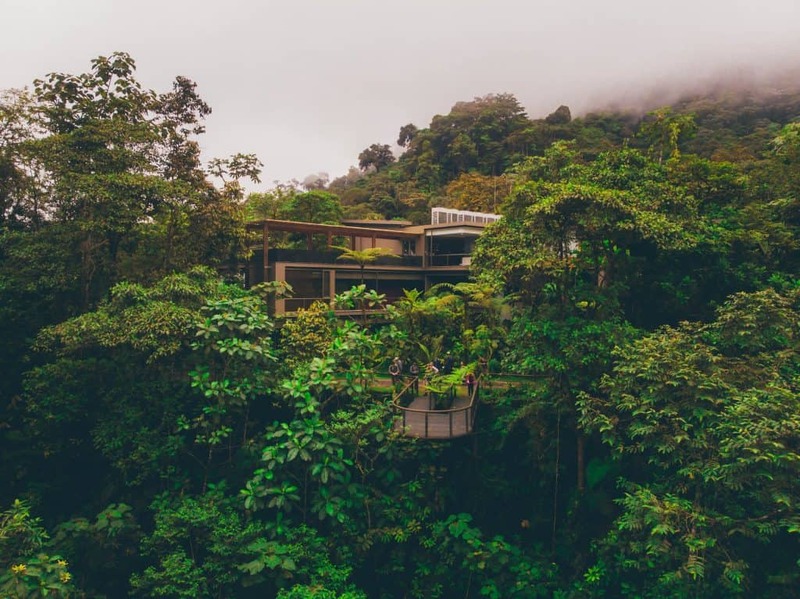 When she returned from her trip she told me about an eco-lodge in the cloud forest of Ecuador that she was adding to her bucket list. It was Mashpi Lodge, and for four years she often talked about wanting to visit. That was until the day we locked our sites on the visiting Ecuador together and checking out Mashpi. 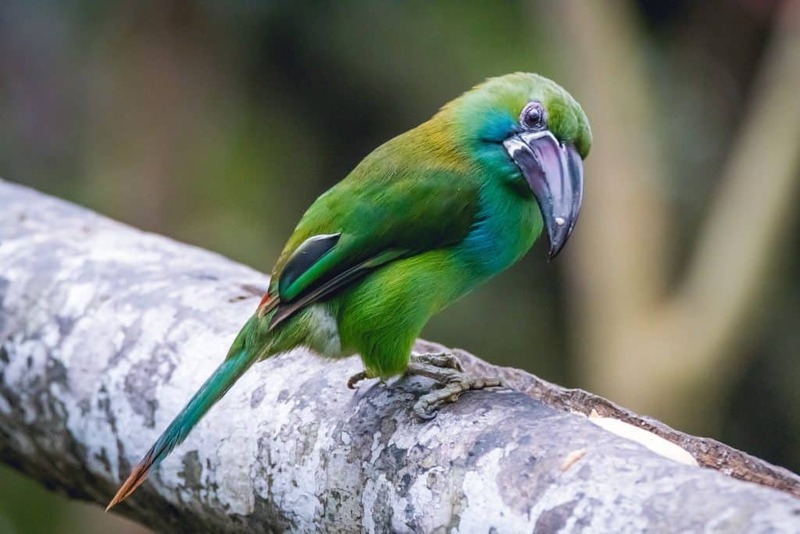 Lucky for us it all included a mandatory visit to UNESCO’s first World Heritage City, Quito, and Darwin’s Inspiration for The Theory of Evolution, The Galapagos Islands. 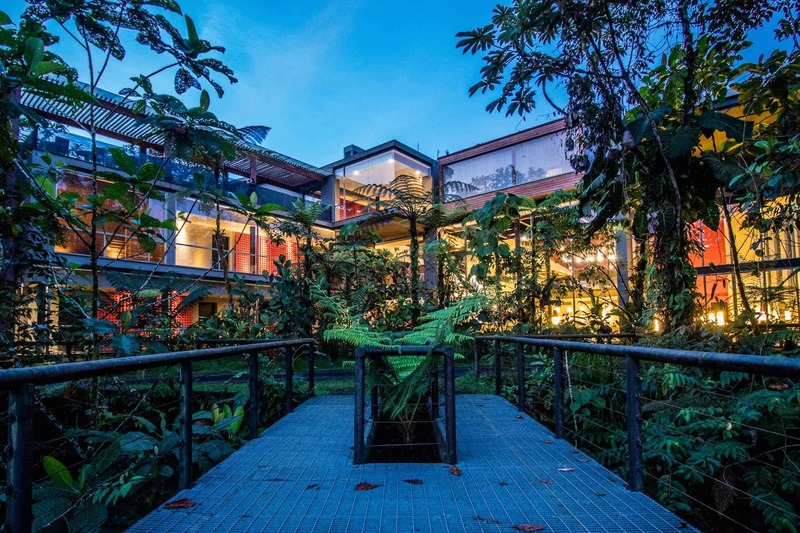 Mashpi is the brainchild of the former mayor of Quito and built on the site of an old logging operation. Now the private reserve attracts conservations and researchers from around the world to explore the forests from the hotel/research station. After spending another night in the lovely Casa Gangotena in Quito we left in the morning for the Mashpi Lodge. 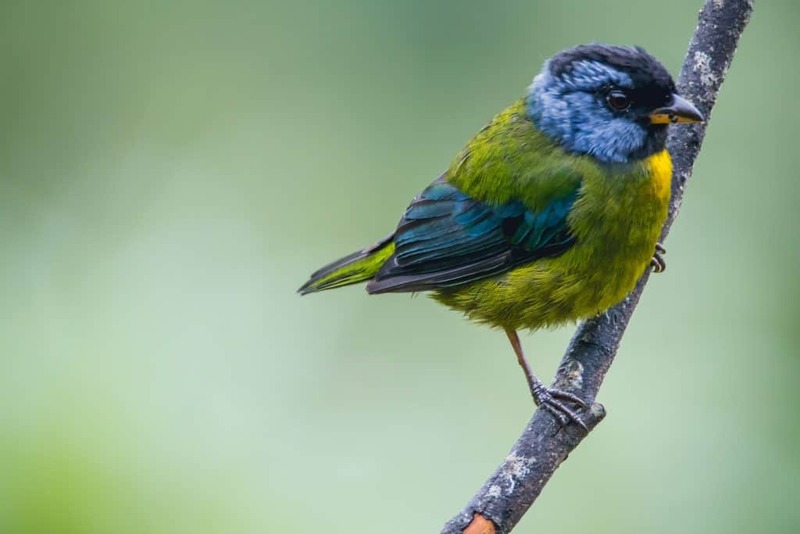 Although Mashpi is technically in the municipality of Quito it still requires a three and half hour drive from the city. Once outside the capital, you begin the descent to Mashpi and the landscape drastically changes. 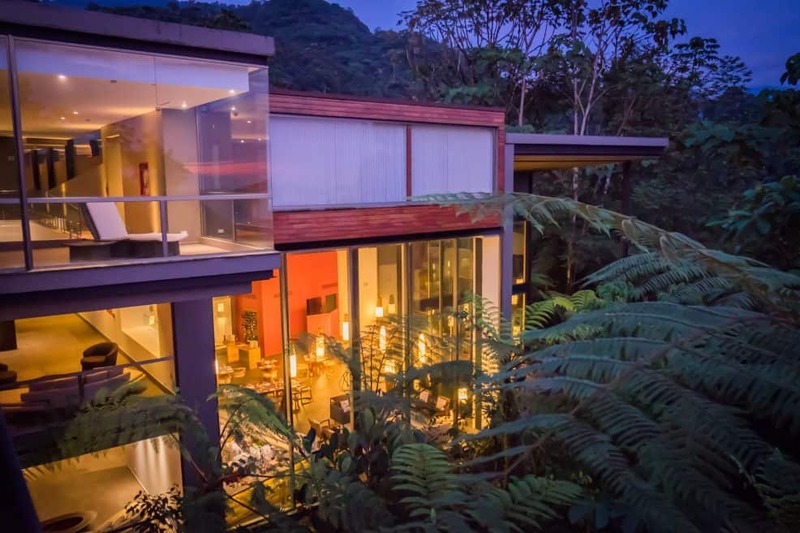 The rolling hills that surround Quito disappear and a cloud forest begins to envelop future visitors. When you finally roll through the gates of the private game reserve you feel as if you’ve reached Jurassic Park. For all the anticipation we had for the lodge we were disappointed when we reached the front of a large concrete rectangular building. However, when you walk through the large steel door you’re greeted with a minimalist modern interior with earthy tones that fall right into the forest. 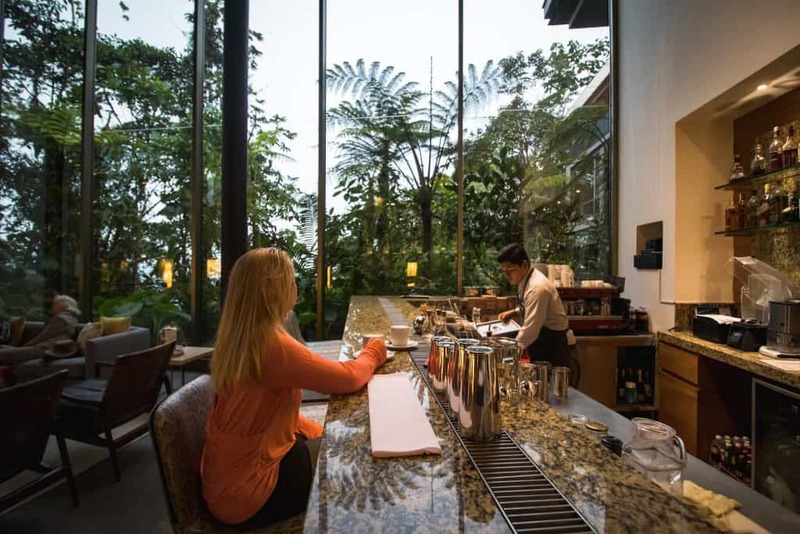 The floor to ceiling windows blend the rainforest with the dining and bar area. Those ceiling to floor windows continues into the bedrooms. While they are simple in design it’s impossible not to enjoy the amazing views. There was no need for much artwork or a TV in the room when the forest outside was the greatest view and had the greatest sound. 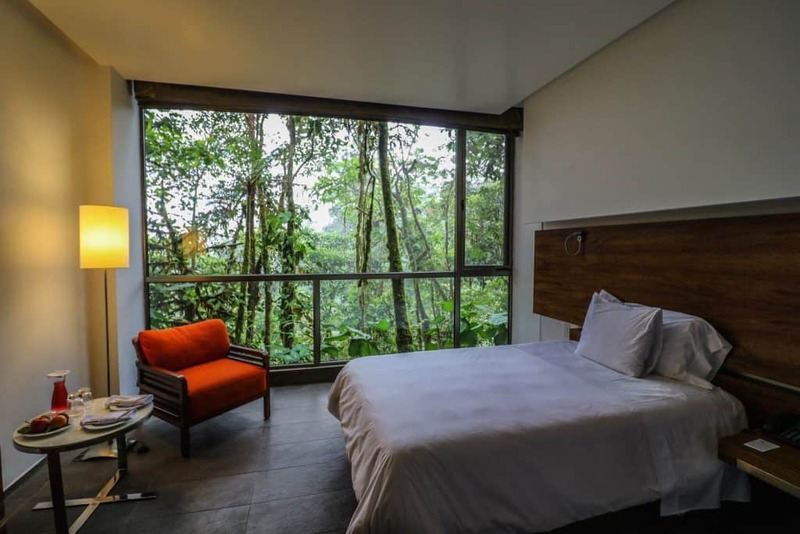 The window was the focal point of the room and with so many activities at the eco-lodge in Ecuador, we hardly had a moment to relax inside anyway – seriously the Mashpi staff kept us busy! 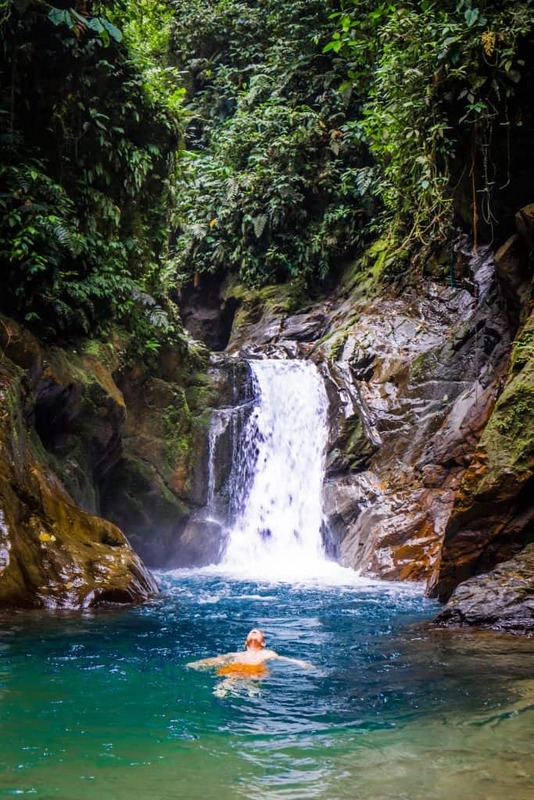 I wouldn’t recommend coming here if your search of relaxed luxury, but if you have a passion for nature and activity the experience is unparalleled. The locally sourced food is wonderful and you’ll never go hungry as it is all-inclusive. Breakfast and lunch consist of large buffets with a variety of options to fit any dietary requirement. As vegetarians, we really appreciated the options. Dinner, on the other hand, is a full-service three-course meal with a menu. 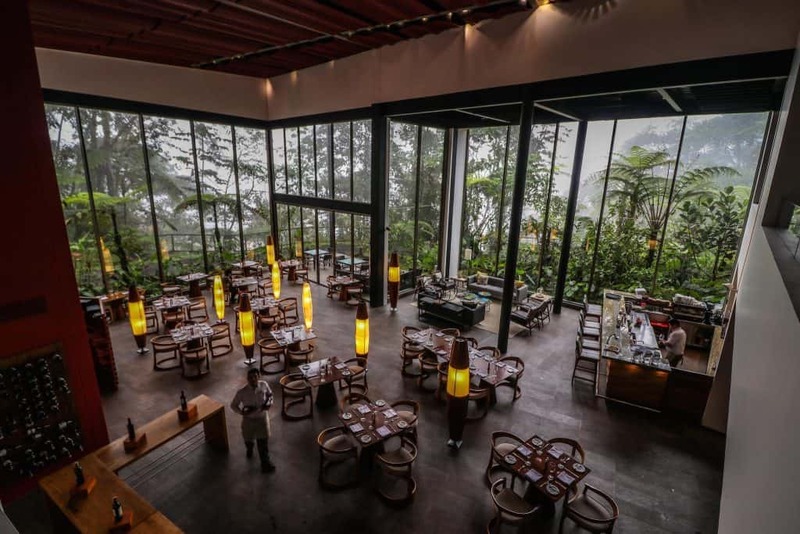 Set inside the expansive dining areas and massive windows you never forget that you’re located deep in a cloud forest while eating. We loved the lodge and it should not have been any surprise that it lived up to all expectations. On our last evening at the lodge, we sat at the bar enjoyed a drink and could not give over the beauty of the whole experience. The National Geographic brand carries a lot of weight when it comes to research and exploration. It shouldn’t have been any surprise that lodges branded with the Nat Geo logo excel at immersive guest experiences. To be a member of the collection, lodges must hold regular talks by trained professional biologist, zoologist, or geologist. With a study being conducted on the lodge’s property while we were there every night involved engaged discussions with biologists. This all happens in the first-floor lounge with a range of books to learn more about Mashpi’s resident animals. This was our second time staying in a National Geographic Unique Lodge (the first was in Iceland) and we’re quickly learning they are a fantastic collection of eco-lodges around the world. It’s tough to pick activities as there are many offered, but the one I was most eager to enjoy was a night walk. Night walks are offered every night and free for guests to join. 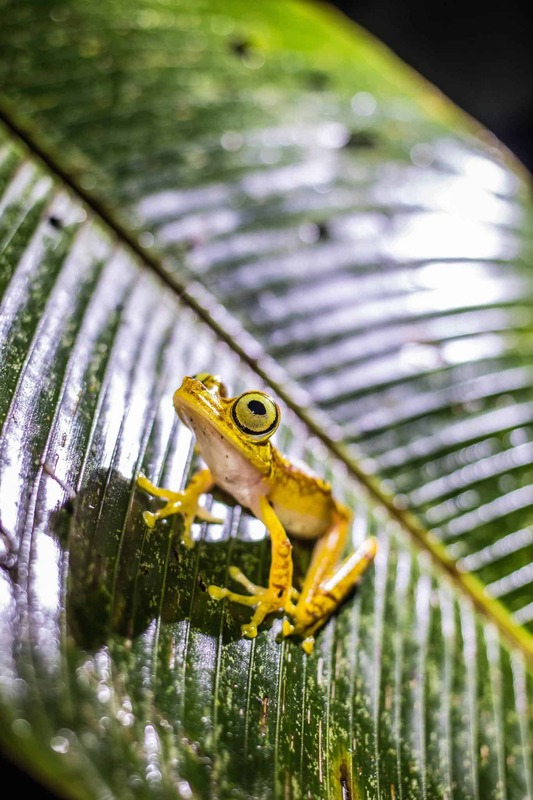 The night walk provides a chance to see various animals not easily found during the day such as insects, snakes, frogs, and nocturnal mammals. 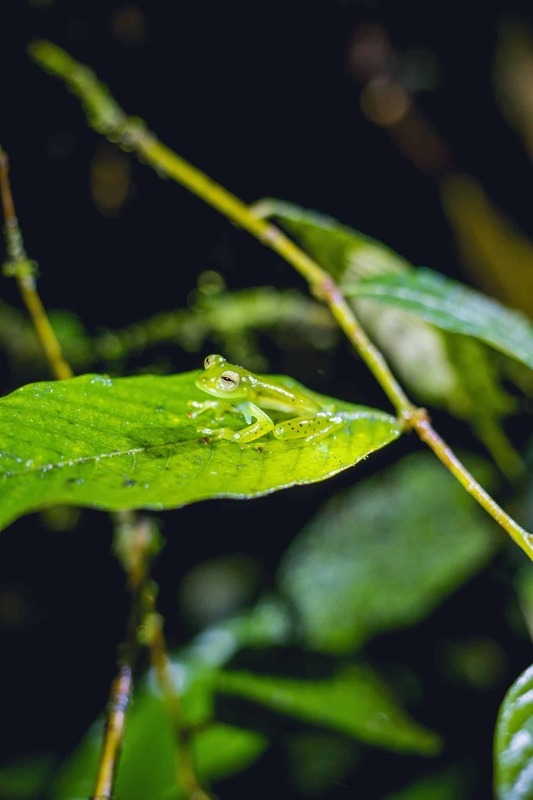 Of particular interest was the emerald glass frog and the indigenous Mashpi frog named after the lodge. I was stoked to find both frogs on our first night! 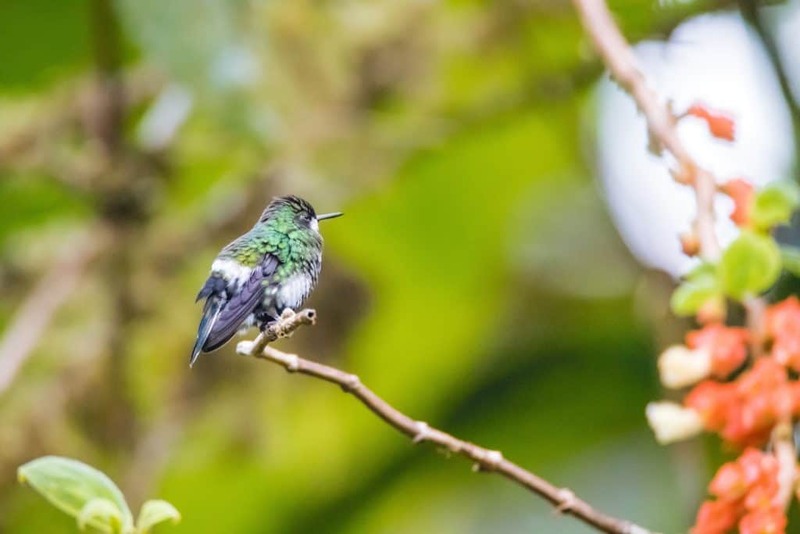 The reserve contains over 22 different species of hummingbirds and a massive range of bird life. The hummingbird garden visit takes visitors for a 15-minute drive to the open garden with a number of hummingbird feeders. As the feeders are put out on display hummingbirds quickly begin darting in between guests and overhead on their way to feed. 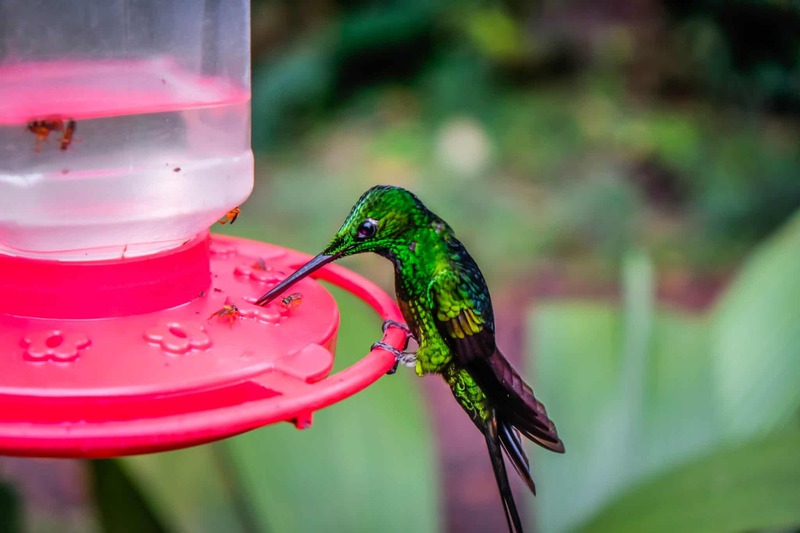 We love hummingbirds so this was a highlight of our trip to Mashpi Lodge! Did you know that hummingbirds have the fastest metabolism of all warm-blooded animals and their little hearts beat more than 1,200 times a minute? 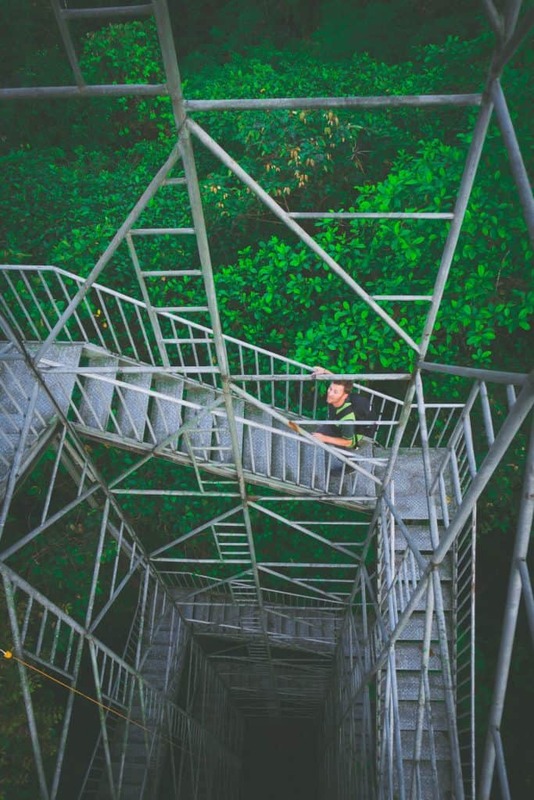 Venture up several stories to the top of the observation tower to catch one of the best views on the reserve. 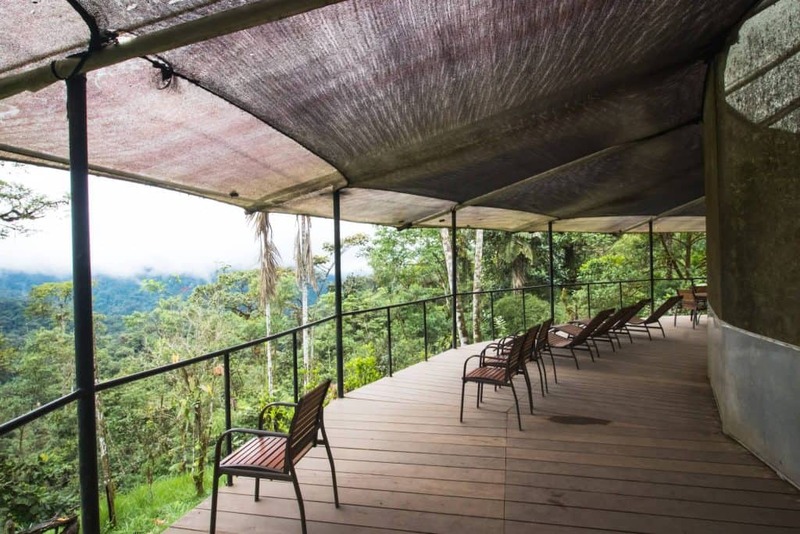 We spent an hour up here watching the cloud forest inhale and exhale clouds whiles bird life darted around the treetops. It’d make for a great place to catch the sunset and we had made plans to head up there, but due to weather conditions, there was no sunset and just clouds instead. 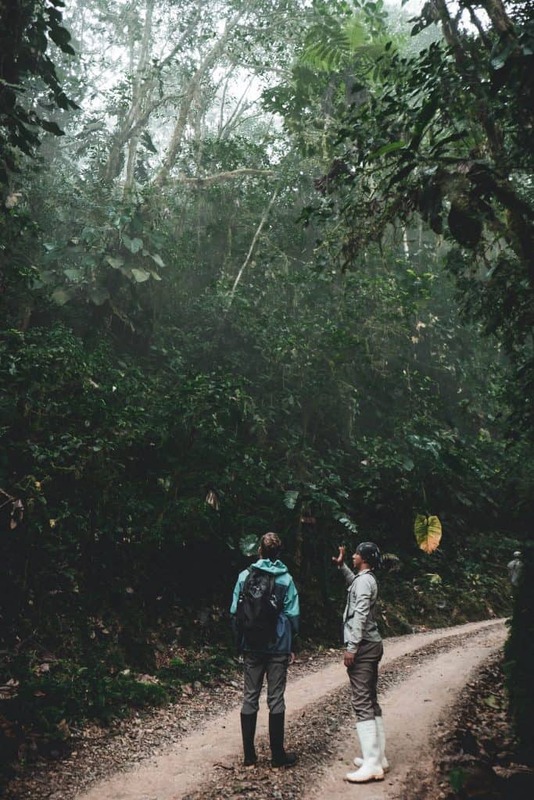 Guess that’s why they call it a cloud forest! We started off our first full day with a long trek through the woods. The reserve has a network of trails and waterfalls that are the perfect way to stay active and explore the forest. The evening before we consulted with our guide on the best trail for the next morning so they always keep ability in mind. The treks through the forest included countless stops along the way to learn about the forest and animals we were witnessing. Our hike linked a string of waterfalls together and provided us a number of opportunities to jump in the waterfalls to cool off. My favorite included a small 4m rock to jump off into the falls below. Instead of hiking back we were able to link with one of the towers on the Dragonfly and take that back to the lodge. 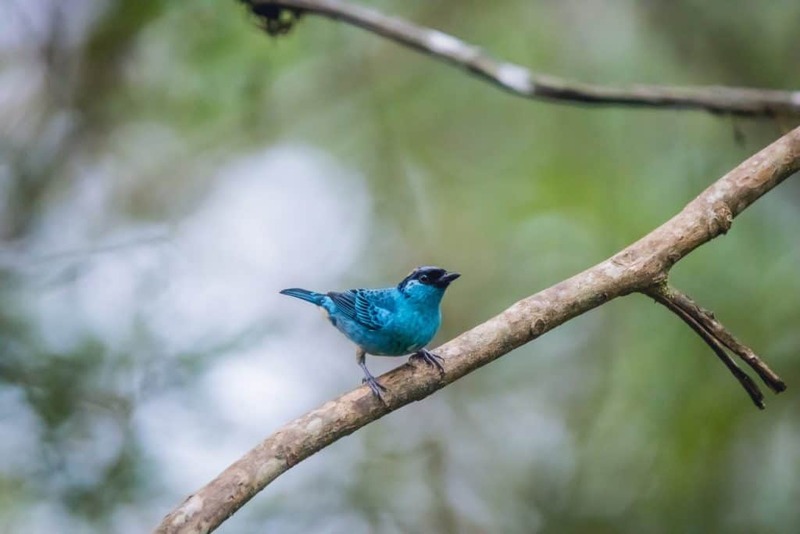 Birders and lepidopterists (butterfly scientist) will find solace in the life center just a short walk from the Mashpi Lodge. It’s an elevated platform and enclosure at the site where a small farm once stood. Now they breed and conduct studies on the butterflies of the reserve. 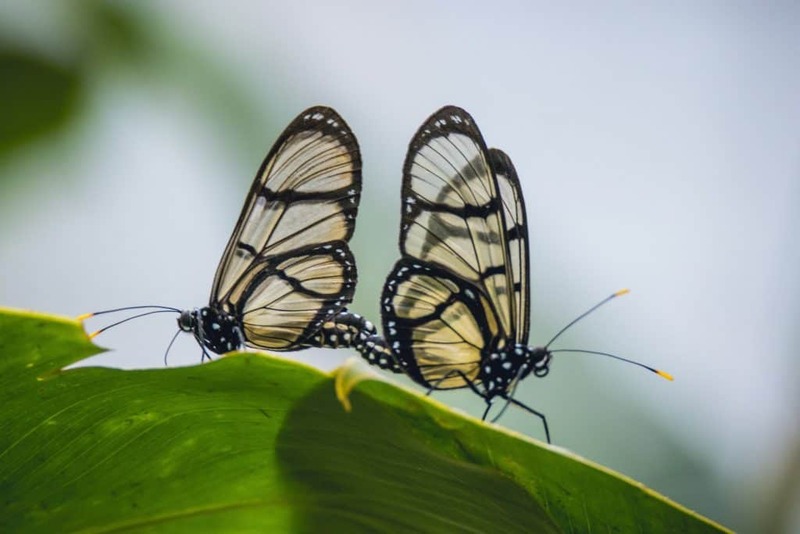 We had a chance to get up close and personal with hundreds of butterflies and catch an amazing glimpse of birdlife from the life center deck. You’ll get a chance to learn about metamorphosis and how they conduct research on the butterflies. We even had an entire family of toucans visit us right before we left. If there is one place in the world to lose your head it’s on Mashpi Lodge’s Dragonfly experience. It’s impossible to explain the view from the Dragonfly as it unlike any experience in the world. We’d seen shots in nature documentaries in which a camera is strung between trees and always envisioned traveling along with the camera in the treetops. It was only a matter of time until someone was daring enough to pull off the massive project. While the massive Dragonfly floats above the forest canopy the Sky Bike takes visitors through the forest. Its distance covered is much smaller and the experience lasts about 15 minutes. However, the bike is totally self-propelled and due to its low footprint cuts straight through the canopy with branches and epiphytes. 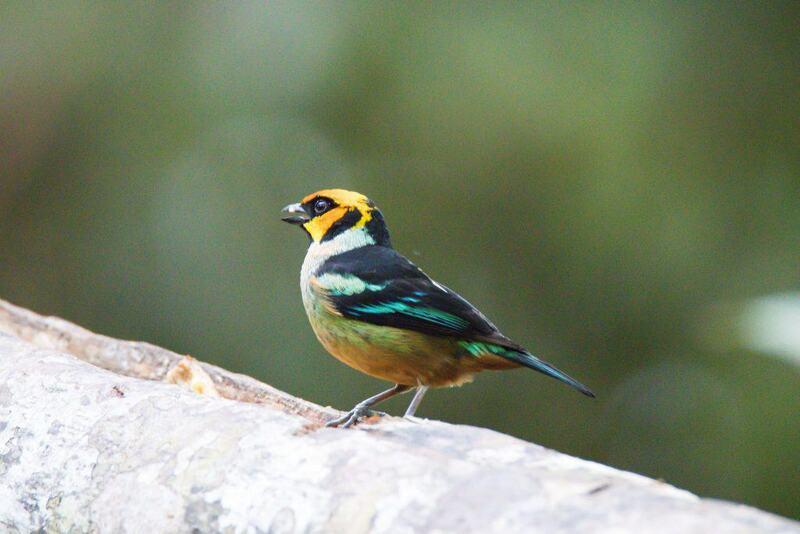 If you’re in search of some amazing birdlife then look no further because Mashpi has a dizzying amount of birds. Our favorites included the hummingbirds, tanagers, and toucans. I’d recommend dressing as if you were going on safari in East Africa. We have a wonderful post detailing safari clothes if you’d like to check it out. That means lightweight quick-dry pants and long-sleeved shirts in brown or green, granted colors are not super important. Don’t bring anything that will stain easily as you will get muddy on the hikes in the forest, if you have gaiters I would highly recommend. 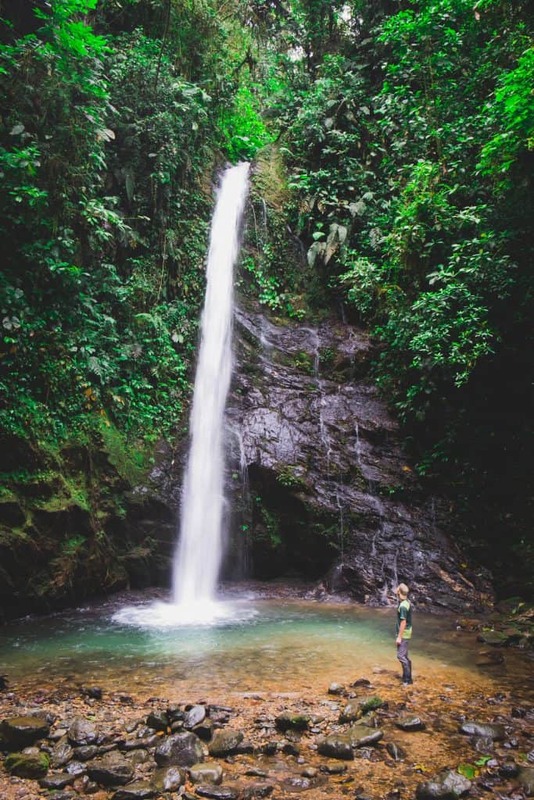 Make sure to pack a bathing suit as you’ll be afforded the opportunity to take a refreshing dip in the waterfalls. Don’t stress about footwear as the lodge provides some wellies or rubber rain boots and even towels for walking in the forest. It gets very humid and muggy in the forest so keep that in mind when packing. If you’re wondering what camera equipment to pack check out our post on safari cameras perfect for photographing wildlife. If you plan on bringing electronics I’d also recommend stuffing some silica gel packs in your bag to help absorb moisture. If you want to have this amazing experience yourself head to the Mashpi Lodge website. Our trip was organized by Metropolitan Touring which took us around Quito, the Galapagos, and Mashpi. 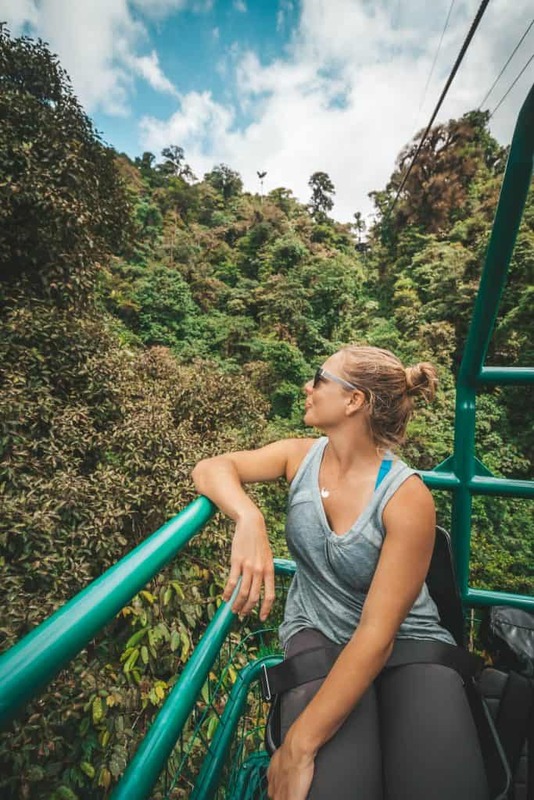 They run amazing tours and I can’t recommend them more for your South America travel needs. The main airport, Mariscal Sucre International, is about 45 minutes outside of Quito city center. Taxi rides should cost $20-$25 to and from the airport. Make sure to agree to a price beforehand or make sure the meter is running. All visitors to Mashpi get complimentary transfers to and from the lodge. The value or the sucre took a nosedive in 2000, and ever since Ecuador has been operating with the US dollar as their main currency. If you go to the ATM to pull out cash don’t be surprised to see USD coming out of the dispenser. You may want extra cash on hand at Mashpi to tip your guides. The tap water in Ecuador is not drinkable. If you’re staying at a higher end hotel like Mashpi they will likely have filtered water always available for you to refill your bottles. If not consider getting a big jug of water and refilling your bottles from that. Try not to waste plastic bottles. Our trip to Mashpi was in partnership with Metropolitan Touring. 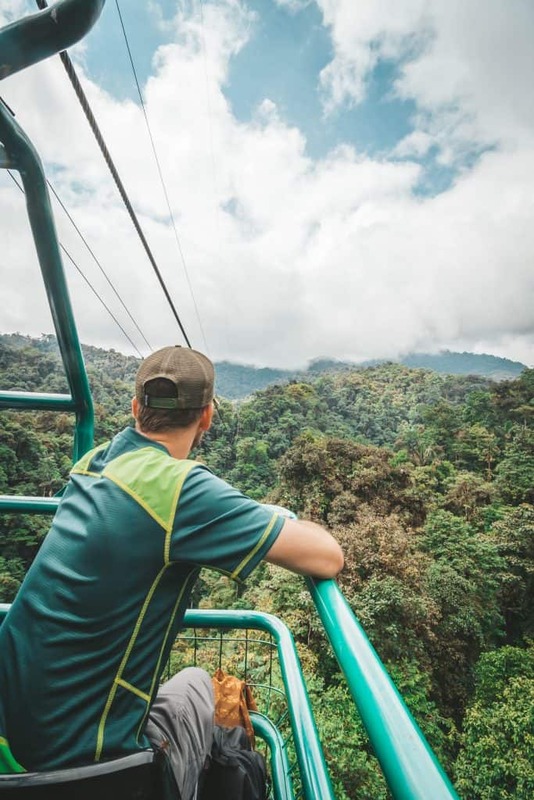 All thoughts about our cloud forest experience are our own.